The Cambridge Companion to Sam Shepard opens with a transcribed interview between Matthew Roudané, the collection's editor, and Shepard himself. The dialogue, like its subject, waxes and wanes across a hundred subjects, painting a picture of a man drenched in American myth. Shepard is a creature of care-worn contradictions: hard-edged but soft-spoken, confident yet casually self-effacing, thunderous in his ideas and quiet in his reflections. His life is like a room filled with debris, a mad scrapbook of outsize personalities, bizarre collaborations, stormy love affairs, and polarizing works. But even in the mess, he seems aware of the poetry in his many long years. In chaos: symmetry. Shepard’s work is always fraught with that: the search for another life. His plays are driven relentlessly by the weight of cultural and personal failure, people struggling to fix things irreparably broken – a family in Buried Child, fraternal bonds in True West, a damaged brain in A Lie of the Mind, an impossible relationship in Fool for Love. They are littered with debris, ransacked homes and motel rooms for burnouts laden with detritus, shattered and misused things. The people in his plays “don't work.” They lack something. They are trapped, held captive often literally in these trashed cells—in La Turista, Geography of a Horse Dreamer, and of course Cowboy Mouth—but escape hovers just above them. He nursed a lust for rhythm in jazz clubs of New York in the 60’s (where he shared an apartment briefly with Charles Mingus’s son)—captured most vividly in A Lie of the Mind and Angel City—and a Beckettian sense of the soul, expressed in his viciously lyrical early works and last plays. In a 1975 review of the one-acts Killer’s Head and Action, Clive Barnes called Shepard “a playwright of the Apocalypse,” but he was much more. Shepard was America’s Beckett, but hungrier to fill the emptiness in the human heart than simply to map it. As an actor, Shepard was always a gravel-voiced, steel-eyed symbol of that empty and cracked America. In his film debut, Terrence Malick's sublime Days of Heaven, Shepard’s nameless farmer watches a biblical swarm of locusts and a ferocious blaze devour his wheat fields. In Country, he and Jessica Lange watch as a tornado obliterates their crops. He plays relics of Western wildness slowly fading into dust: the aging Frank James in The Assassination of Jesse James by the Coward Robert Ford, or a past-his-time Butch Cassidy in Blackthorn. He garnered plaudits for a supporting turn as MG William Garrison, commander of the failed Operation Gothic Serpent in Black Hawk Down—another grab at immortality up in smoke and blood. Elsewhere, Shepard springs up warmly like a bush in the desert of Cinema Americana, lending his breed of cowboy cred to film adaptations of Steinbeck, Cormac McCarthy, George V. Higgins, John Grisham, and fellow playwright Beth Henley. 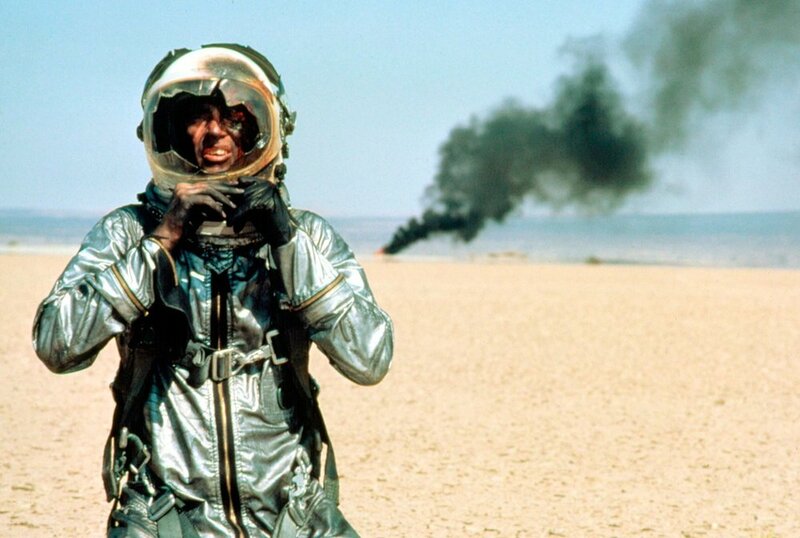 Shepard’s great triumph, of course, was as Chuck Yeager in Philip Kaufman’s The Right Stuff. In the film’s climax, Yeager shimmers into view amid the pluming smoke of a wrecked Lockheed NF-104A. Bill Conti’s score swells into glorious fervor as Shepard, singed coal-black with his parachute mustered in heaps behind him like the train of an emperor, marches out of the mist. In an approaching ambulance, a medic asks test pilot Jack Ridley (played by music legend Levon Helm), “Is that a man?” Ridley grins. “You’re damn right it is.” Shepard gets the ride into the sunset, the gritty American glory that his own characters are always denied. Notably, the all-American Shepard was seldom associated with works outside the American ethos, save in a few distinct cases. Twice he worked with German director Wim Wenders (on Paris, Texas and Don’t Come Knocking), another artist concerned with wringing national identity from ruined hearts and places. One of the few films Shepard played in not penned by an American is by that other soul-of-his-country dramatist, Shakespeare. Michael Almereyda’s 2000 film of Hamlet cast Shepard as The Ghost – introduced in a state of translucency, wandering empty halls. He saunters in front of a soda machine, the Pepsi logo clearly visible through him, his sloping leather-jacketed frame made slight as gossamer by the grave. Onscreen, Shepard was never a chameleon disappearing into a role. He was cast to play himself. He never put on a costume; he simply wore his own skin. 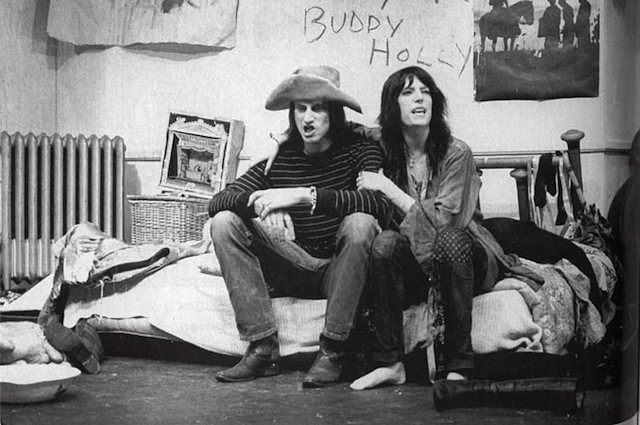 Most New Yorker theatre mavens old enough recall the moment Shepard gave febrile, fiery legitimacy to the Off-Off-Broadway scene, alongside Patti Smith at the American Place Theatre in 1971. Smith and Shepard wrote the one-act Cowboy Mouth: “on the same typewriter, you know” Smith said in After Dark in 1974, “like a battle.” Smith and Shepard lit the flame of Cowboy Mouth from the heat of their own love affair, which saw them dreaming together of fame and art in a Chelsea Hotel room not unlike the one in the play. In the same double-bill with Cowboy Mouth, Shepard’s Back Bog Beast Bait featured his then-wife, O-Lan Jones. Cowboy Mouth is as hungry, hopeful, and otherworldly as its characters, a dizzy feat of lexical chaos that filters the heady chaos of a Joyce novel with the word-winding flights of a Caryl Churchill play. Cavale (Smith) holds prisoner Slim (Shepard) in a helter-skelter motel room where she dreams of his ascension to the status of rock-and-roll Messiah with her clinging to his robes. On the floor, “raggedy costumes,” and “seedy wallpaper with pictures of cowboys peeling off the wall.” Cavale has Slim tell stories of Rimbaud and French poets, and the pair plunges madly into a universe of pure pretend, drug-and-lust-addled fakery. Slim seethes and struggles under the weight of his own huge dreams; Cavale can’t let go of hers as they poison her against reality. Cavale’s name, as she reminds us in the play’s last moments, means escape. Shepard departed Cowboy Mouth mere moments into its run in New York. The play, though a staple of theatre education in the US and a rote scene study for acting students, is seldom revived. Shepard initially attributed his departure to a fear of live audiences, whom he found “too spooky.” But certainly the fear ran deeper. In Cowboy Mouth, Shepard wasn’t just pretending, he was pretending to be himself, to fix himself. He returned to the stage in 2004, to play in Caryl Churchill’s A Number as a man named Salter who clones his son and then, one by one, meets with each clone. Shepard’s turn as a man seeking wearily to fix his dire paternal error garnered praise, a return worthy of Lazarus. By the 2000s, Shepard was no longer the reckless son of America, struggling to name himself, but its bleary-eyed patriarch speaking to future generations. One of his last film roles saw him as the vanishing paterfamilias in August: Osage County, the movie of Tracy Letts’ Pulitzer-winning play that lives irrevocably in debt to Shepard’s work. Shepard was, to be sure, a magician of the same sort. His sorcery mingled with axle grease, his entrapment with escape, his failures with triumphs, and his ordinariness with greatness. He was a virtuoso of broken things, as he will be remembered—a mechanic born to fix the American soul.